A little while ago, I went to the Harvard Book Store to hear Mark Vonnegut speak about his own mental illness, his famous father and the importance of art in both their lives. Two things really stuck with me. The first was the necessity of writing; the second was this quote, a reference to Vonnegut’s stint in a Canadian commune. This is exactly how I hope to feel someday when I look back on even the most ridiculous of my decisions. This summer I left the country for two months and came back with an addiction. To Gchat, obviously. But you probably figured that out from the title I wrote, thereby spoiling my own intended dramatic opening. Most instant message clients annoy me, but I could easily just sit on Gchat for an entire day. So I started wondering what, exactly, was so different about Google’s version. Most instant message clients annoy me because most people annoy me. It’s not Gchat that I love; it’s my contacts list. The people I GChat with are the people I had been used to spending almost all my time with, until summer flung us to various countries, states and time zones. In a rare instance of ever-pervasive technology bringing people together instead of creating a barrier between them, it kept us in touch when we otherwise might have drifted. And for that, I owe Google a tremendous debt. So if they want to go ahead and take over the Internet and all of the media, I won’t put up (much of) a fight. 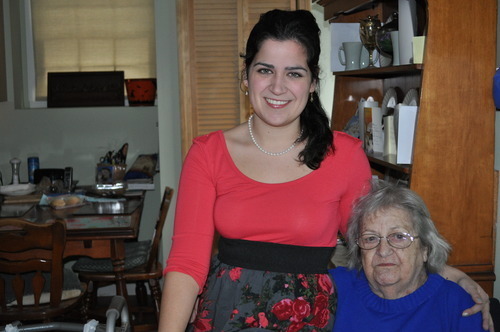 My nana, Lena Saad, was the single strongest person I knew, or could ever imagine knowing. I can’t imagine the thought of getting through the day—any day—knowing she’s not there. I can’t imagine staying however many thousands of miles from home, in a strange country, away from my family and close friends. I can’t imagine finishing out this program. But yesterday, Nana told my dad that she wanted me to stay, to finish out the program, if anything happened to her. Knowing that, that’s the only way I can stay. In her honor, in her memory, in her legacy, I will be strong. Rest in Peace Lena Loretta Saad, 11/21/26-7/17/10. I love you, Nana. That’s a big thing. I’ve seen it represented visually as a roller coaster and an iceberg, and I’m sure there are countless other drawings designed to give culturally (and, apparently, verbally) isolated American students an idea of what to expect when studying abroad. Even the name implies a gigantic sensation. It’s not culture tremble, culture shiver or even culture cough. It’s a shock to your system—a pretty big deal. But here’s the thing. I’m not feeling it. And I mean that both figuratively and literally. Maybe my problem is with the concept, or maybe it’s the terminology. I don’t believe you should go into a new situation expected to be “shocked” by what you encounter. To me, the idea presumes that you’ve only ever considered your own way of doing things, and the deviations from that pattern will rock you to your core. That’s just closed-minded. I’m mildly offended that people would think like that, but what really bugs me is that that’s how I’m expected to react. Nope. Call it naivete if you want, but I prefer to call it flexibility. I’m here to learn how another culture works, not to let that culture shock me. I’m actively adapting, not passively being shocked.